One of Black Lightning’s greatest strengths in the early part of this season is its ability to take the larger issues affecting Freeland and use them to tell small-scale stories about various communities. Whether it’s the Pierce family, the student body at Garfield, or the various neighborhoods that make up Freeland, the show continues to find ways to build its world while keeping the intimate focus of the storytelling. It’s a tricky thing to pull off, but Black Lightning’s been doing it since the jump, and “Black Jesus” is another sterling example. Last week’s episode dealing with Khalil getting shot at a peaceful protest against the 100 Gang felt like a ham-fisted attempt at creating conflict for Jennifer and the Pierce family, but this week’s episode uses Khalil’s pain in a much more interesting way. Last week’s episode felt clunky because of the sloppy way the show sought to challenge Jefferson’s return as Black Lightning. The first two episodes of the season saw Jefferson struggling with what it would mean to bring Black Lightning back to Freeland; the effect on his family, his job, and the community at large all weighing heavily on his mind. Khalil getting shot, and the melodramatic fashion of the reveal that he may never walk again, felt like an overly conspicuous way to put that struggle into more concrete terms. This week though, the show expands on what Khalil’s diagnosis—by the end of the episode it’s confirmed that his spinal cord has been fully separated and that he won’t walk again—means to the Pierces, Black Lightning, and Freeland. What makes “Black Jesus” more successful than last week’s episode is the way the whole episode actually revolves around Khalil, even if he doesn’t get a ton of screen time. Rather than being used as a vessel for conflict that can be easily discarded down the road, he becomes integral to the continued story of the return of Black Lightning. He, along with a troubled student named Bernard who gets hooked on a new drug called Green Light that seems to give its users some sort of super strength, acts as the catalyst for a number of events. Jefferson wrestles with the fact that his activism as Black Lightning will always come with collateral damage, something he has difficulty handling now that he’s older and has gained some perspective, and Tobias and Lady Eve see Khalil’s shooting as an opportunity to turn the public against the superhero looking to clean up the streets. It’s not unusual for a superhero story to begin deconstructing the role of the vigilante, though of course Black Lightning can do it sooner than most given the superhero’s previous presence in Freeland. What’s encouraging to see is that the show doesn’t lean into any heavy-handed statements or unnecessary family drama. There’s no ridiculous fight amongst the Pierce family about Black Lightning, and there’s no mass hysteria from the people who populate the city. Instead, there’s grounded conversations about what it means to be a hero in a community that desperately needs one. When Khalil gets shot, and when Jefferson is forced to use his power in a school washroom when confronted with the drugged-up, super-powered Bernard, it’s an opportunity for the show to dig into the mythology of Black Lightning and the social dynamic of Freeland. Bernard and Khalil’s individual situations cause Jefferson to question what’s best for his community. He believes Black Lightning is necessary for stopping the flow of Green Light, which seems to go above and beyond the 100 Gang, and yet he’s having difficulty stomaching the necessary violence that comes with any sort of social change. Jefferson’s struggles are complemented by Anissa’s own. “Black Jesus” sees her using her powers for good for the very first time, and yet the actual act of violence isn’t as easy to undertake as she’d assumed. When she lays out two drug dealers who, earlier in the day, were trying to sell drugs to some of her students, all of her talk about revolution and change snaps into focus, a physical toll suddenly part of the equation. To speak about rising up is one thing. To experience the physical, violent struggle is something completely different. She calls an ambulance for the two men she takes out, both of whom are barely breathing. It’s a stirring sequence because it not only challenges us as viewers to see past the usual faceless, victimless, “humane” violence of these shows, but also makes the whole “with great power comes great responsibility” thing all the more visceral. Anissa gets her hands dirty for the first time, and it’s a shocking experience. When she helps Grace fend off some attackers later on the moral implications are a bit clearer, but she still realizes that there’s no easy way to respond to the kind of actions that define the 100 Gang. That scene provides a number of other ones with necessary context. 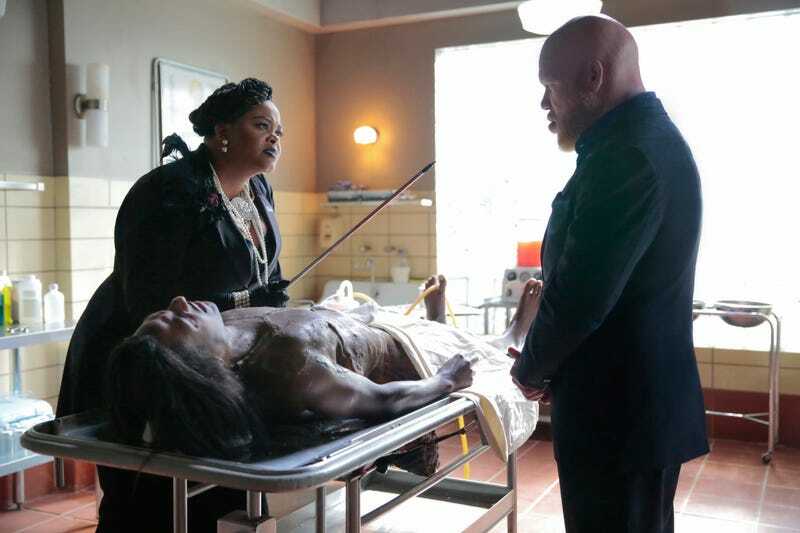 Anissa’s passionate defense of Black Lightning to Inspector Henderson looks different once she’s been in the streets and reckoning with violence in such an immediate way. It also highlights Jefferson’s own conflicted approach to justice in Freeland. When he attempts to talk to an old friend, 2-Bits, who’s been dealing Green Light, it doesn’t go as planned. This isn’t someone Jefferson Pierce can save from a life of crime. So, he comes back as Black Lightning and gets the information, and a compromise, that he needs. When is Black Lightning necessary? When is Jefferson Pierce’s community activism, and Anissa’s own actions, a more productive approach to helping Freeland? “Black Jesus” doesn’t settle for any easy answers, but rather wades into the murkiness of those questions. The fact that nobody can keep a straight face when saying the name “2-Bits” is a great running gag. I have no idea what Lady Eve was doing to that (still alive!) body, but it was very, very gross. I watched my screener with headphones on and the noises were unbearable. When Anissa attacks the drug dealers, her words about how heroic Black Lightning is take on a new importance. They feel less like the words of someone who vehemently believes in the cause, and more like the words of someone trying to define their own newfound power.